Pooh Sticks is undoubtedly the favorite game that Winnie the Pooh played and he played this game with his closest friend Christopher Robin mostly when they had nothing else to do in the day. As it is every year people gather from all around the world to celebrate this as a means to show their love and affection for the world's most adorable bear. The game is a frictional game that finds a mention in author A.A. Milne's classic children's book The House At Pooh Corner. 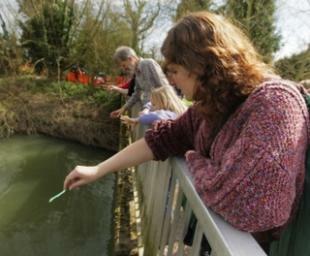 This year too nearly 2,000 people gathered at the World Pooh Sticks Championships held in Little Wittenham, near Dorchester-on-Thames to play this wonderful fun game. The game is essentially easy to play with participants required to through sticks into the river from a bridge to see who's emerged first. The event managed to raise nearly £1,000 for the Royal National Lifeboat Institution, Rotary clubs and some money will go to restoring a local church's roof. Entry costs £2 per person, £6 for a family and £0 for a team.